Cuter than the real thing, Frosty The Kitten is an adorable interactive cat for Android users. 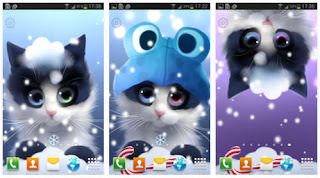 This live wallpaper is perfect for Winter and Christmas! The same devs who made Yin The Cat are also responsible for this gorgeous creation. so don't forget to check all of their apps. Frosty is a little winter kitten to accompany you through the waiting days to Christmas and New Year! Complimented with various customization options and interactive playfulness. You can free download Frosty The Kitten Apk from the link below but you're welcome to buy it if you like it! If you're more of an owl guy, then don't miss Little Owl Live Wallpaper by Apofiss.